« SIX AMAZING MAINE SPRING FLINGS! At this point, I will add that we use three different size Bodum Dome type french presses at Brewster House, depending on how many cups the table needs. (Follow the Bodum link to purchase one for yourself:) The press we use the most of is marketed as a 34 ounce, 8 cup or “1 liter” press. It will provide 3+ mugs of coffee. For a single, a “12 ounce” will do. For 3 or 4 coffee drinkers, we pull out the “Saturn C5” 51 ounce (12 cup or 1-1/2 liter) monster, that will provide up to 5 mugs. Secret #1; Coarse grind the coffee beans! You can do that at the coffee display at a grocery store, or in your own grinder, but it may require a bit of a lighter hand with an inexpensive blade type grinder. We use a conical burr type grinder for its consistency, but we use a small blade type for decaffeinated beans to avoid mixing the two. With the conical burr version, we set the grind on just above coarse. When using the lighter grinder, I give it 3 or 4 short bursts, allowing the larger beans to drop down to maximize them getting ground, but to avoid making the whole grind too fine. The goal here is to simply avoid grinding the coffee so small that you end up spitting out coffee that snuck through the the press screen! Secret #3: Add BOILING WATER in the correct amount. I’m stressing boiling here, as that temperature is needed to bring out all that fine coffee beans have to offer! Simply fill the carafes to the base of the ‘arrow’ at the top of the frame of the device. By sizes that amounts to 8 ounces for the small press, 28 for the medium press, or 42 for the large press. Now stir in the floating grounds, preferably with a wooden spoon (so as to minimize the possibility of cracking or breaking the glass carafe). 3-5 seconds will do! Then replace the press parts in the press, being careful to place the pouring screen in the top in line with the spout on the carafe. Just settle the screen in far enough to keep the grounds below the surface at this point. Secret #4: Check your watch and start the 3-4 minute wait to coffee nirvana. This is a matter of how strong you like your coffee! You could even go for 5 minutes, or add an extra scoop to meet your preference. Now, gradually press the screen down to the bottom of the carafe to hold the grounds out of your pour. Fill your Brewster House mug and let that fragrant, rich aroma bring you back to your time with us….. or just come back and enjoy your morning coffee, offset with the buttery sweetness of Mary’s amazing butterscotch scones! Bon appetit!! BUT COME TO BROWSER HOUSE AND LET US SPOIL YOU by doing all this (& more) for you!! Wonderful post! Now I know how to work a French press correctly! If I could only get to the Brewster House soon to hand you do it for me, that would be the best! Wow, from “the boss!” Thanks! Have you considered offering me a “blog for hire” position yet?? 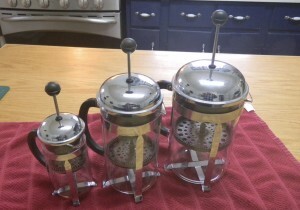 When you come to visit, we’ll have a french press at home too!